Stripped the toilet paper & Kleenex for their nests? I hope we move before I find a pistol. This last stunt hit me hard. I was proud once, dammit. Kept the paint bright, planted trees. Saw the house a quarter mile away. Felt solid, taken care of. Boo-hoo batshit. Don’t let me walk across that bridge alone. For at least a year now I’d go take a midnight bath and hear a sound like someone dropping rocks against the wall. Just a handful, only once each time. Knew it might have been a critter, but with old adobes, you never know. Sometimes dirt just falls down from the ceiling. This is even normal. I know that’s hard for you to grasp. But I could easily tell myself that walking on the concrete floor shook something loose. As if. Today I happened to be outside and noticed that the bathroom window in the dead landlord’s apartment was ajar and the screen was hanging loose. I fetched the secret key, crunched through the weeds, and gently kicked the old door open. Not too hard, or it would be in pieces. Inside, the bathroom door was barricaded with an upended coffee table. I’d done that when I saw the awful mouseshit. This after a good six years without ever going in the place, because why, you know? But I had to open it to reach the window, see, and when I did, a pile of dirt fell out into the room. I stood there staring. The rocks and dust inside were over a foot deep. It had to be from gophers. What else? Wherever they were digging, they’d tunneled in (mud walls, remember) and used the dead landlord’s bathroom to get rid of the dirt. The way the place is laid out, this depository is just a few feet from the bathub on our side of the wall, so of course I heard them. How many gophers are we talking about? I have no idea. Doesn’t matter, either, except that I’m ashamed to let exterminators see us here. I can’t believe we’re living like this. I can’t believe it’s gotten to this point. This isn’t how it was supposed to be. It’s all perverse and backwards. Seventeen years before the mast… I couldn’t be more sick of being stuck and crazy. Tomorrow we’ll go looking at another house for sale. I’m predisposed to hate it, though I’m curious. 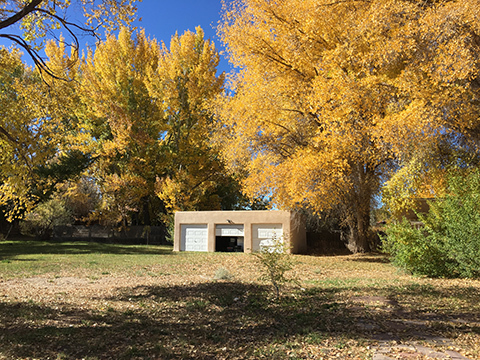 The previous owner died inside of natural causes—Taos, maybe—but the agent’s info says the interior has been “professionally cleaned” and certified free of plague. It’s a very nice home, by the way, and I hope it doesn’t smell. I doubt we’ll try to buy it since it’s too close to the road and costs too much, but at least we’re out there looking and I’ll bet there are no gophers in the walls. UPDATE: Aside from acknowledging the melodrama that results from writing while depressed, I’d like to say the property we looked at wasn’t bad except for traffic noise. It has almost an acre of land and everything in the house is totally new, including the washer and dryer, and there are actual closets and high ceilings. The adobe walls are two feet thick. It’s like a bloody fortress! With the windows closed, the traffic fades away. The well is new as well. Not bad.There’s no dirt falling on the floor, no gophers, and a great big lawn with giant cottonwoods. Here’s the ole garage. It’s awful inside and the neighbors have big barky dogs, but what the hell is new with that, damn Taos and the dogs. I’m looking for another place too. The house I’m in now is too big, 1,900 sq. ft. and four bedrooms for just me and an old cat. My problem is I have no idea where I’ll go. I’ve lived in 22 places and liked most of them, even LA way back when. I guess the best way to decide where I want to move to is to sell my house. We’ll find something, John. I forget, are you in Texas now? If your house is paid for, you’d be all set to see what’s over the mountain. If we weren’t here, I’d be looking for an ocean, but it all depends. This place we looked at is attractive. I just don’t know about the traffic. Where we live now is quiet. We’re going to think about it. Yeah, paid for and I’m in a Ft. Worth suburb that’s highly desirable because of the school district. My two loves are the desert and the ocean and I’m leaning towards the ocean, maybe a little place near the Texas coast. I lived in Galveston years ago and liked it but it’s too big now. Don’t think too much. When I think too much I make the wrong decision. Or rather, I take so long thinking about it that I can’t make a decision at all. Is there any such thing as a wrong decision anyway? Every decision is a step on the path. I’m babbling. That’s because it’s 4am and I couldn’t sleep because I had a severe toothache. Just ask Kathy if she wants to buy it. So sorry about your toothache! Kathy’s interested. Besides the nearby traffic, the only other drawback is there ain’t no fireplace or wood stove. I guess that’s not the end of the world. It’s way more solid than our old place in MD. Well. Maybe you will go deaf. Problem solved. The cat won’t last long though, as it’s probably not road-smart. This could be a problem. We drove over there this evening—it’s only 10 minutes from our present location—and the traffic was pretty awful. The other thing we discovered were the neighbors’ pit bulls (loose). Callie wouldn’t like them, either. Yikes! Pit bulls and barks with it! Buy the house, then build a catio that your kitty can use to go outside. She’ll be contained so that she can’t get to the road, and the big barky dogs can’t get to her. There’s a guy here in Austin who builds great catios, and if you’re handy you could do the same. His website is thecatcarpenter.com. They’re very attractive, aren’t they!